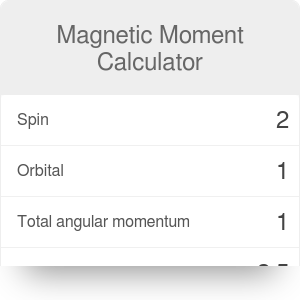 The Magnetic moment calculator helps you compute the magnetic moment of an atom. The text below explains the origin of the electron magnetic moment and provides with the magnetic moment of an atom formula. the magnetic moment of the nucleus. The contribution from the magnetic moment of the nucleus is usually much weaker than from the first. Because of this we only focus on the electronic part of the magnetic moment of an atom. μB = 9.274 * 10^(−24) J/T is the Bohr magneton. The g-factor generally relates the magnetic moment to the angular momentum. Such relation holds even if the angular moment is an intrinsic spin, and not an actual angular motion. The second contribution to the magnetic moment of an atom comes from the actual orbital movement. In quantum mechanics, not every circular motion is allowed. We say that the orbital motion is quantized. You can check other consequences of quantization of the orbital motion in the Hydrogen energy levels calculator. gL = 1 is the g-factor for the orbital motion. The total magnetic moment of an atom comes from adding the spin and orbital contributions. J is the quantum number describing together the spin and orbital contributions. gJ = 3/2 + (S(S+1) - L(L+1))/(2J*(J+1)). Computation of the magnetic moment of an atom is simple with our calculator. It is enough to specify the total quantum numbers S, L and J. The calculator computes then the g-factor and the magnetic moment. We express the magnetic moment in Bohr magneton units, which is a convenient unit to describe magnetism in the micro-world. Magnetic Moment Calculator can be embedded on your website to enrich the content you wrote and make it easier for your visitors to understand your message.